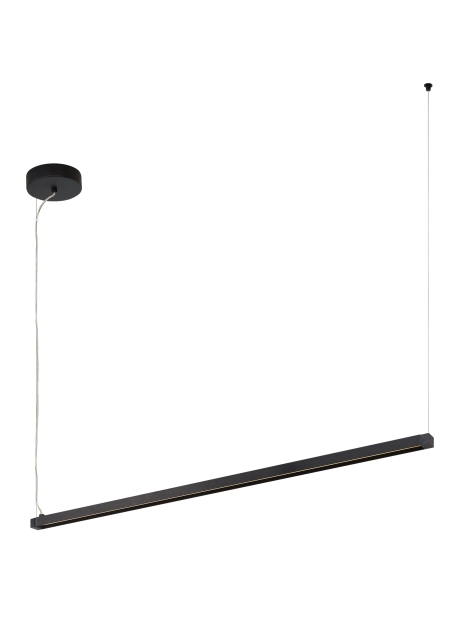 Ultra-modern and ultra-minimal the Dyna Linear Suspension by Tech Lighting appears to float effortlessly in the air. This contemporary work of light is ideal for Kitchen island task lighting, office spaces, family rooms and commercial lighting applications. Dyna is available in either a 4ft or 8ft run and ships with powerful integrated LED’s. You can create longer runs using the available mechanical connector to join units together in series. The suspension piece is fully dimmable to create the desired ambiance in your special space. 4ft version ships with 25.2 watt, 1538 delivered lumen, 90 CRI, 2700K, 3000K or 3500K LED linear modules. 8ft ships with 50.4 watt, 3076 delivered lumen, 90 CRI, 2700K, 3000K or 3500K LED linear modules. Dimmable with low-voltage electronic dimmer. Ships with twelve feet field cuttable cable. Length -- Choose -- 48" 96"